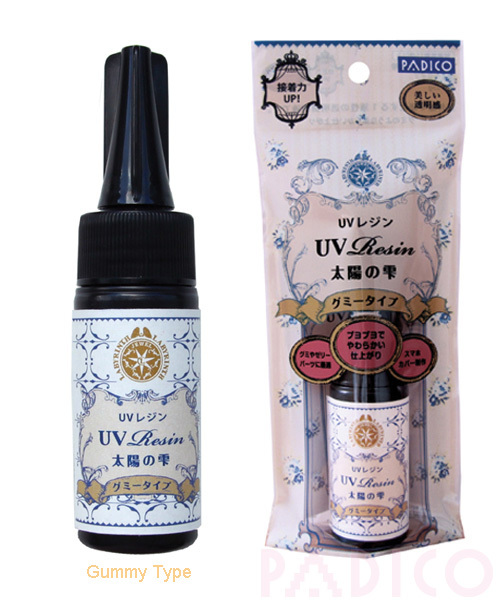 UV Resin "Drops from the Sun" is transparent resin gel which cures when exposed to ultraviolet rays. Produced by Padico. The resin has been improved in quality with high transparency and stronger adhesiveness. The milky white color packaged resin is for gummy type. 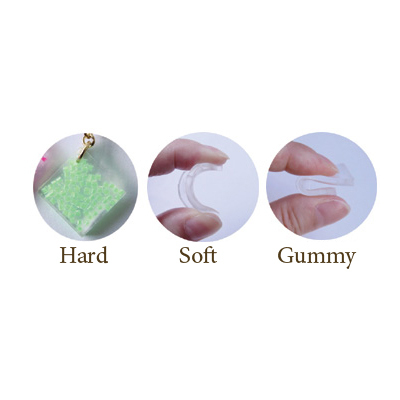 The gummy type resin is also suitable for jelly-like look accessories. With its soft finish, you can cut the edges clean with scissors after it is cured. Unlike 2-part epoxy resins, this UV Resin is "ready for use", no mixing required! Use just the amount you need without wasting resin and time. This resin gives a very clean, transparent look and has outstanding hardness properties. 30 - 60 minutes with sun rays on cloudy weather. NET 25g packed in a black bottle. No Fire. Use resin in a well-ventilated room. Use gloves, glasses, and apron to protect the direct contact with skin, eyes and clothing. Do NOT left UV resin for a long time under the fluorescent light to avoid curing in air. Proper storage temperature: 0℃- 25℃.